A mailing list is simply a list of customer email addresses that you can use to send out targeted marketing email blasts. Customers can signup to a mailing list on your store on the checkout page, customer registration page, or through a mailing list widget and can be placed on other pages. There are two types of mailing lists: Internal and Third Party. Completely managed inside AmeriCommerce online stores. This list type uses the Customer table for storage. This is the only type of Mailing List that can be emailed via the AmeriCommerce online store software. Orders Total Under $ will only select customers who spent under the amount you choose. Situations may occur where a browser subscribes to the mailing list without an order. When this happens, the system creates a ContactInformationOnly for the email address input. If the subscriber returns later and registers, the customer record updates with their information. Sending emails to lists is now handled via the Customers > Write Email menu. Then select the Mailing List to send to via the dropdown menu. When a customer signs up for a mailing list, their email information is sent to the third party mailing list service. We currently integrate with the following third party email marketing services: ConstantContact, MailChimp, ExactTarget, Bronto, and Campaign Monitor. More information: How to set up a mailing list using Mailchimp | How to set up a mailing list using Constant Contact. List Type: You can chose internal here, or chose a third-party mailing list described in the types of mailing lists section. Is Default: This check-box changes the display location of the mailing list signup checkbox on the checkout page. If this is checked, the mailing list signup checkbox will display in the billing address section of the checkout page and on the customer registration page. If this is not checked, the mailing list signup checkbox will display only in the Mailing List Subscription panel further down on the checkout page. Only one mailing list can be marked IsDefault per store. Auto-Opt In: When this is enabled, the checkbox for the mailing list signup will be automatically checked. 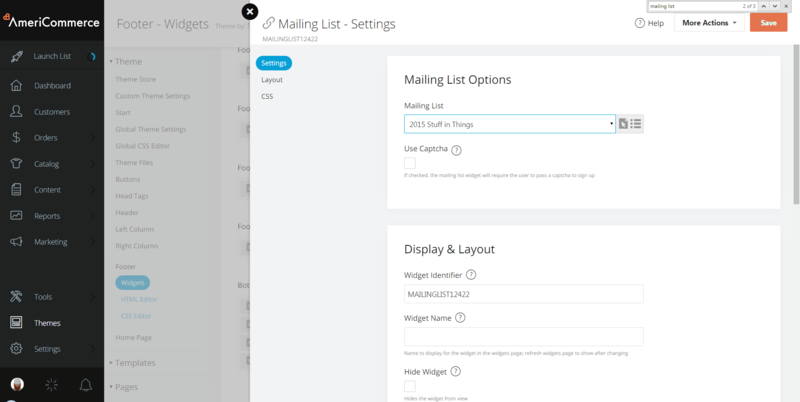 Hide: Hides the mailing list signup from display on the checkout page and registration page. When a mailing list is hidden. Auto-Opt in is disabled when a mailing list is hidden. Public List Name: This will be displayed on the checkout page if the list is not marked as IsDefault. One Page Checkout Display Rules: You may wish to allow customers to signup for a certain mailing list if they purchase certain products. These rules let you specify which category of products must be in the cart before the mailing list signup will display on the checkout page. This setting is optional. Leaving it blank will make the mailing list show up for all products. Request Opt-In to Mailing List: Shows/Hides the store's default mailing list on the checkout and customer registration page. Default Mailing List Opt-In To "Checked": If this is enabled, the store's default mailing list signup check box will automatically be checked. 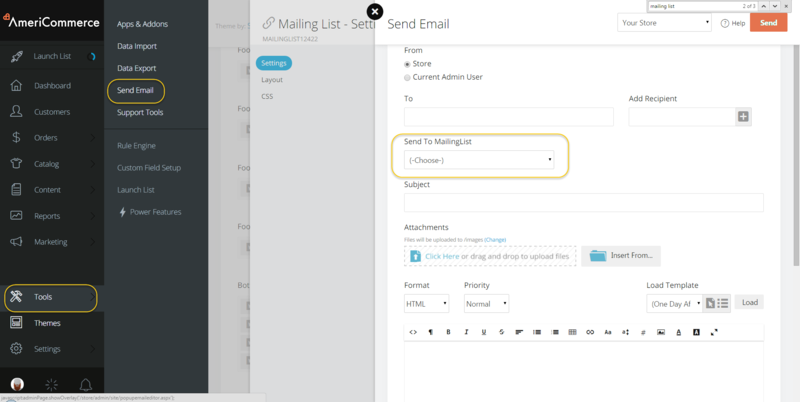 Once you click New, the new mailing list edit screen will be displayed. Give the mailing list an Admin List Name, assign a store, and chose Internal or a Third Party list in the List Type Drop-down. If the assigned store does not have a default mailing list already setup, you may wish to check this one as `IsDefault`. If you do not check IsDefault, be sure to input a name in the Public List Name Field. Click Save to create the new mailing list. -- See the Mailing List Settings section above for more information on these and other mailing list settings. If you just want the mailing signup check-box to be displayed on the checkout page and the registration page, there's nothing else you need to do. If the check-box is not displaying in these locations, make sure if you have a list setup in Marketing > Mailing Lists, and make sure it is not hidden. Also to make sure that Request Opt-In to Mailing List is enabled in Settings > People > General. If you would like to display a mailing list signup form on another page, for example, in the footer, you will need to add a mailing list widget to the page. The following steps will show you how to add a mailing list widget to the footer, but these steps can be used on any other page. Then, just treat the Send Email screen like any other email client and click Send when you're ready to send out your email blast to the mailing. "You will need to choose were you want the email to sent from the stores default email listed under store setting, or from the email address assigned to the user that is logged into the admin console." An H in "were/where" and a comma after "from" sure would make that sentence much more readable, and understandable. ;) Just sayin'. Thanks for the feedback! I have fixed that. Our apologies for the confusion! Have a great day and happy selling! I couldn't get this to work with the new interface. From the main page, it's Tools-->Send Email. From there, it's pretty easy to send an email to the InternalList. Is there a way to put a text field in the mailing list widget for the subscriber to put comments? There's no setting to add in a comment box on the mailing list widget -- that's a good idea though! Feel free to submit it as a feature request at vote.sparkpay.com. I'm trying to figure out a way to capture customer's name and email address by creating "info only" customer record when they fill out a contact form so I thought using the mailing list widget might do the job if there was a comments field so I could use it as a "contact form" (the mailing list widget creates an info only customer record). Got any ideas on how I can do this?